If you wonder why university administrators go to such considerable, unethical, and, often illegal, lengths to cover up scandal within their intercollegiate athletic programs, Joshua Hunt has some answers for you. Hunt was a foreign correspondent for Reuters in Tokyo and an investigative reporter whose work has appeared in The New Yorker, The New York Times, Bloomberg Businessweek, and other distinguished publications. Hunt’s reporting on Nike and Phil Knight led him to the University of Oregon, a.k.a. the University of Nike, and to the intersection of corporate power and higher education in America. 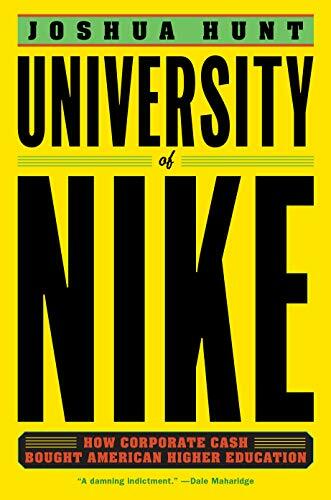 As the title suggests, this is a book about Nike and its power and influence over the University of Oregon. It is also about intercollegiate athletics and its insatiable appetite for money. And it is about corporate power and its hijacking of American universities. It is a story that goes beyond the confines of higher education, one that has historical roots in the Cold War, and, one whose roots go as far back as the late 19th century. Hunt writes that this is not a biography of Phil Knight, although there is a considerable amount of biographical information within this book. Certainly Knight is central to Hunt’s views on higher education and corporate power. On the other hand, Phil Knight’s drive for money and power dominates a goodly portion of these pages. The judgements made by Hunt on Knight’s character and business ethics are certainly less than flattering. Still, the center of the story is that of the American university and how it was taken over by national and international corporations to the detriment of education and the community that the university is presumed to serve. Knight’s role in this process is one of trail blazer and pathfinder. Knight’s development of Nike and his use of intercollegiate athletics to expand his personal wealth is one part of the model he created. The other part is how he parlayed his wealth into power over the university by lavishing money on the University of Oregon at a time of declining financial support for public higher education. Not only was this true at the University of Oregon, but it was being replicated across the United States. One result, claims Hunt, is that the public university that served as a means of social mobility for vast numbers of Americans through much of the 20th century lost its way and now serves corporate masters as an institution devoted to and fueled by research. The model that Knight built was modified and enlarged upon by those who emulated him. This change was a bi-product of the creation of the Military-Industrial Complex during the Cold War. Then the university became a research institution whose primary activities were interwoven with defense contractors. Those who saw beyond the immediate issues of the Cold War also realized that the university could be captured to serve the interests of the corporation. This was true of Phil Knight and Nike, but also true of chemical, pharmaceutical, and a host of other companies. Fundamental in this change, claims Hunt, was the passage in 1980 of the Bayh-Dole Act giving researchers, professors, and universities, ownership over anything they produced with federal grant money. The education of students, a particularly significant part of the mission of the land-grant university, took a back seat to research. The democratizing function of education was slowly but surely eroded. Simultaneously, public funding was in decline, further increasing the dependence of public universities on outside money. As it turned out athletics, especially football, proved a very effective vehicle in university fundraising. Hunt finds the consequences of these related and convergent developments in many disparate places across the society. The University of Oregon during the presidency of David B. Frohnmayer gets considerable attention. It should be noted that this sort of relationship between American business and public universities existed from the beginning. The land-grant university was designed to promote American free enterprise, and the business elite of local communities controlled the Boards of Trustees. This is a point that Hunt could further develop. Hunt’s overall argument is compelling, although the presentation is at times chaotic. Hunt jumps from one subject to another, one geographic location to another, one decade to another. He introduces a veritable army of characters often only serving redundancy in his arguments. Just when it seems a main line of thought is being developed, a leap is made to another line of thought, at times never returning to the original. In short, things get messy. However they never get dull, and the material often produces outrage. Many of the principal characters, like Frohnmayer, emerge as victims and scoundrels simultaneously. Some, like Phil Knight, are brilliant thieves whose egos are larger than their fortunes. This is an engaging tale full of humor, pathos, and disgusting human behavior with important insights into contemporary problems. Some might think that makes it just like real life.